Home Lifestyle Entertainment Local Couple Wins BIG on The Price is Right! 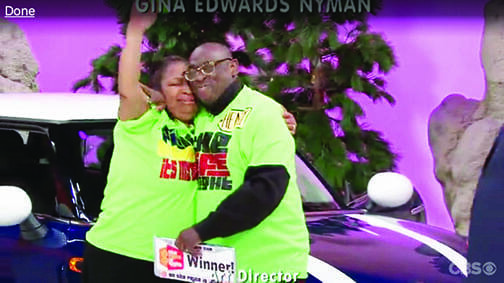 Pastor Henry and wife Dr. Pamela Davenport were big winners on The Price is Right show. NASHVILLE, TN — Like millions of viewers, Bishop Henry Davenport and his wife, Dr. Pamela Davenport, were longtime fans of the classic television game show The Price is Right. The show’s exuberant tagline “Come On Down!” now takes on a whole new meaning to this couple because they won and won BIG on the longtime hit show. It all started earlier this year (March 14th), when the couple took a trip to Los Angeles to celebrate Mrs. Davenport’s birthday. “I took my wife on the trip because she had been wanting to go on The Price is Right show for years. So, I said, ’Well let’s go!’ I really wanted them to call my wife’s name but lo and behold, they called my name instead!” Pastor Davenport shares with the Tribune, on what turned out to be a trip of a lifetime. Rev. Davenport with show host Drew Carey during the Showcase Showdown segment. The Davenports almost didn’t get on the show. They were scheduled to be in the audience for the 9 am taping but due to Los Angeles’ infamous heavy traffic, they missed the taping. But thanks to luck or in this case, divine intervention, they finally made the taping for the 1:00 pm show, which actually took almost two hours to complete. Everyone is asked to be seated in the TV studio about an hour before taping begins. The pastors had no idea that the show’s announcer George Gray would bellow: “Henry Davenport—Come On Down!” And that’s exactly what he did. He eagerly ran down to claim his spot on the show’s ‘Bidder’s Row’ with the other contestants. 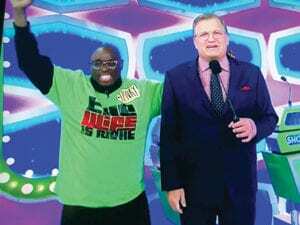 The Reverend was the fourth contestant to make it on the stage with Price is Right show host Drew Carey. He went on to win an all-expense paid trip to beautiful San Diego. Later in the show, Pastor Davenport’s skilled bidding and continued divine intervention took place again when he finally reached the show’s final Showcase Showdown segment, for a chance to win a 2018 Mini Cooper automobile and a luxurious trip to Calgary, Canada. Bishop Davenport’s bid was $28,000 for a showcase that was $29,300. The other contestant overbid on her showcase, leaving the Bishop as the big winner of the day!